Sakura Fortune Slot Online - ▶️ Win Up to 950x Your Bet! Welcome to the Japanese inspired Sakura Fortune online slot game from QuickSpin. From the moment this 5-reel, 4-row, 40 payline slot opens on your screen, you will feel the calming embrace of an ancient culture that has never been lost. As Sakura Fortune loads, you will be greeted by the Princess and classical music to match the theme, as she invites you to accompany her on a journey to defeat evil emperors and to find great riches. So grab your sword and let the adventure begin by stepping into the world of Sakura Fortune. 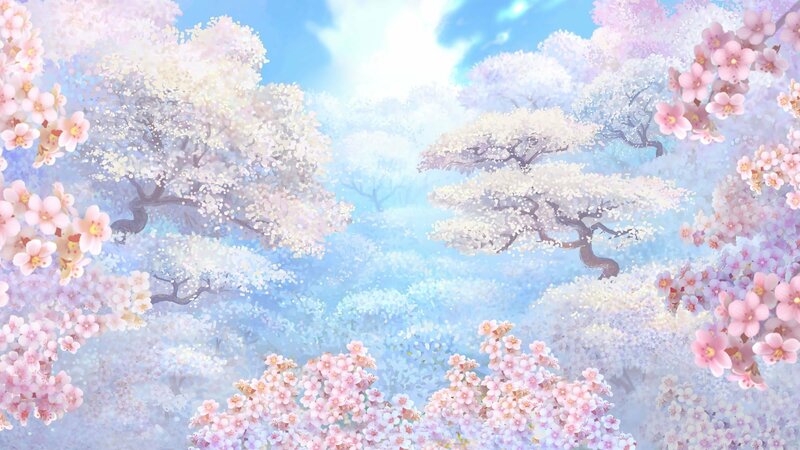 Sakura Fortune boasts strong, detailed imagery and matching soundtrack that truly sets the scene. The animations are smooth and classy, and the developers have clearly put a lot of time and attention into the details. The reels are surrounded by blossoms, and a simple glance at the symbols, lets you know you are in for an Asian adventure. Getting 2 Princess Wild stacked (take up the whole reel) symbols, triggers the re-spin feature. Based on the number of stacked wilds on the reels, is the number of re-spins awarded. The re-spin feature continues for as long as wilds continue to land on the reels. Whenever 2 or more Princess Wild symbols land on the reels, if the wild is not fully visible, at random, the reels can shift up or down to fully expose the wild and ensure the entire reel is covered. Sakura Fortune has 9 main symbols. The low-value symbols are four ancient coins. The high-value symbols include people and statues, with payouts for 5 symbols ranging from 2x your bet up to 10x your bet. There is also a bonus scatter symbol, represented by a golden fan with the words Bonus across it. Landing 3 or more bonus scatter symbols consecutively from the left-most reel initiates the Free Spins feature. Finally, and as mentioned earlier, the Princess Wild symbol doubles as a scatter symbol as well as a wild symbol, and takes up 4 cells/positions, potentially covering the entire reel and creating multiple winning combinations. Sakura Fortune does not have a separate bonus feature, such as “spin the wheel” or “pick a treasure”, etc. As described earlier, the game does have a Re-spin feature that is triggered by getting at least 2 stacked princesses on the reels, plus just in case she doesn’t cover the whole reel, the nudge feature may at random come into effect and move the reel to reveal the full symbol and initiate the re-spins. Landing 3 or more consecutive bonus scatter symbols, from the leftmost reel, on a single spin, initiates the Free Spins feature. During the Free Spins, any Princess Wild that lands on the reels will expand to cover the entire reel and will stay that way and in that position for the duration of the Free Spins. Plus, an additional Free Spin is awarded each time a Princess Wild appears during the free spins round. Sakura Fortune does not have a fixed jackpot amount and it is not linked to any progressive jackpot. With the various re-spins and free spins features, combined with the stacked Wild Princess, the opportunity to rack up some big wins is highly possible. Sakura Fortune has 40 fixed paylines and you can bet anywhere from 0.20 up to 100 coins per spin. Note that the bet amount is the total bet amount and not per payline. Sakura Fortune has an RTP of 96.58%. This is fairly standard and offers some good winning opportunities. 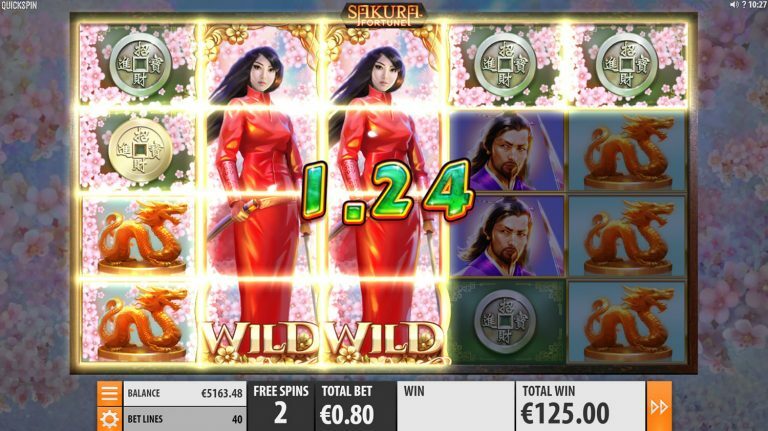 Sakura Fortune has a reported high volatility, which means you will need to spin the reels a fair amount of times to get some wins happening, but once you trigger some of the features, that’s where the big wins start to happen. In our experience of playing Sakura Fortune, we were extremely fortunate and started hitting wins and features after only a handful of spins. Sakura Fortune is fairly simplistic in terms of features, but overall, it’s good fun to play. The imagery is flawless and the extra little animations of some of the symbols, give it a bit more flair. The soundtrack and effects are perfectly matched to the theme. QuickSpin have done a great job, but they definitely could have thrown in a few more thrilling features and bonus rounds. It’s definitely worth taking Sakura Fortune for a spin.